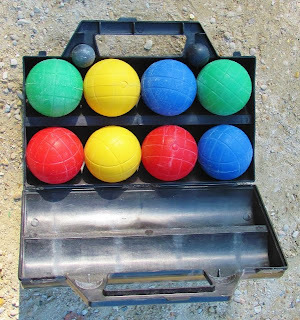 Tossing boules on dusty courts in parks, along canals, or on street corners appears to be the newest thing for bobos and is of course a perennial among the geezer brigade. Here's my take on the phenomenon, with my photos here, on Travora dot Com. Click the link to read the whole story. 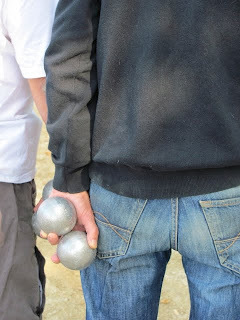 Now you’ve heard everything: Parisian hipsters are playing pétanque? But clay-court bowling is for boule-bores, right? Those retired, ornery, provincial guys smoking corn-paper Gauloise cigarettes? Think again: casual-chic bobos (bourgeois bohemians) with high-color boule balls are storming Paris parks—not to mention the dusty banks of the Seine, Canal Saint Martin and Canal de l’Ourcq. Practically every linear, un-surfaced open space from the Place Dauphine on the Ile de la Cité to the Boulevard Périphérique beltway ringing Paris is regularly transformed into an ad hoc boulodrome—a pétanque bowling alley. Rome- and Paris-based writer David Downie is the author of “Quiet Corners of Rome,” “Food Wine Rome,” and “Paris, Paris: Journey into the City of Light.” His latest book, “Paris to the Pyrenees: A Skeptic Pilgrim Walks the Way of Saint James” is published in April, 2013. Downie is also a guide, creating custom tours of Paris, Rome, Burgundy and the Italian Riviera for private clients. His websites are www.davidddownie.com and www.parisparistours.com.